SRINAGAR, July 28: Former Chief Minister Mehbooba Mufti and president of People’s Democratic Party (PDP) today appealed Prime Minister Narendra Modi to accept the hand of friendship and dialogue extended by Pakistan’s Prime Minister-in-waiting Imran Khan for ending bloodshed in Jammu and Kashmir. Mehbooba said this at her party’s 19th foundation day which she used to allay any fears of wide spread dissent against her leadership as all legislators from Kashmir, except the disgruntled seven, were present at the function. The PDP president requested the Prime Minister to respond positively to the Imran Khan’s friendship offer. “I appeal to Prime Minister Narendra Modi, a new Government will be formed in Pakistan and there will be a new Prime Minister, who has extended a hand of friendship towards India. He spoke of dialogue. He (Modi) should respond to it positively. It is my request that he (Modi) should grab the opportunity and respond positively to the offer of friendship by Imran Khan,” she said. Mehbooba said that the Jammu and Kashmir has always been biggest challenge for the PMs and elections should not become an impediment reconciliation process with Pakistan. “Elections come and go. (Then Prime Minister) A B Vajpayee extended a hand of friendship to Pakistan and also announced a ceasefire on the borders. This is statesmanship, such leaders do not think about elections but about the people. Jammu and Kashmir is the biggest challenge for the PMs of our country, be it Jawahar Lal Nehru, Indira Gandhi, Rajiv Gandhi, V P Singh, I K Gujral, Vajpayee or Narendra Modi,” she said. The PDP president said the PM who resolves the issue of Jammu and Kashmir will have his name written in golden letters in the history. “The PM who resolves the Jammu and Kashmir issue within the ambit of humanity, ends bloodshed in the State and improves relations with Pakistan, his name will be written in golden letters in the history,” she added. Mehbooba said during Chief Ministership, she impressed upon the PM the need to hold dialogue with Pakistan as well as people in the State. “I met Narendra Modi and told him about the frequent killings and the need to put an end to it. He said he went to Lahore without an invitation but Pathankot happened after that. Our Home Minister went to Pakistan for a conference and he was invited by his counterpart for dinner but the host did not show up. It was an insult. I told him that we are the sufferers as our people are dying. We have to stop this bloodshed. So it is necessary to talk to Pakistan and with the people of Jammu and Kashmir,” she added. Mehbooba said she also impressed upon the Prime Minister that the Hurriyat leaders arrested by the NIA should be released on Eid as a goodwill gesture if Modi-led Government wanted the separatists to come to the dialogue table. Reacting to the civilian killings during her tenure as Chief Minister, Mehbooba said there were clashes every day which led to killings. “There was nothing in my hands. What was in my hands I did. We got the Centre to announce a ceasefire and the killings stopped”. On the challenge to special status of Jammu and Kashmir, she said while her party succeeded in getting the BJP to make a commitment that Article 370 will not be touched, there was a need for all parties to unite to protect it. “There was challenge to Article 35A. It was our efforts that Attorney General told the Supreme Court to defer the hearing on the case as Centre had appointed a Special Representative for holding dialogue in Jammu and Kashmir. The last two years have been a headache for me as there was always some issue or the other to deal with. I appeal to all parties — both from mainstream and the separatists — to set aside differences and come together to defend Article 35A, which is a major challenge,” she added. 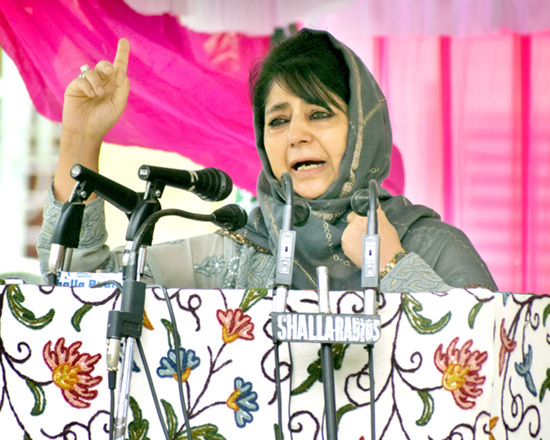 Mehbooba said her Government was not allowed to work as she had wanted on the development front. “There has not been a day since 8 July 2016 that we were allowed to work in peace,” she added. Senior PDP leader and Lok Sabha member from Baramulla Muzaffar Hussain Baig on the occasion warned of another partition of India if lynching of Muslims over cow-smuggling allegations were not stopped. “We want to appeal Prime Minister Narendra Modi that the killings of Muslims in the name of cow should be stopped. One partition has already taken place in 1947 (but) more could take place if the killings of Muslims are not stopped,” he said. Baig was referring to the incidents of mob lynchings targeting Muslims in the name of cow vigilantism. Baig said the PDP had allied with the BJP in order to ensure justice is done to Muslims across the country and Kashmiri people. “I realize this thing that we allied with the BJP and several people said that we allied with a party that is an enemy of Muslims. And it is true,” Baig said. The PDP leader said his party did not ally with the BJP for the power. “We allied with BJP so that they can trust Muslims and treat them justly. We allied with BJP so that justice is done to Muslims and Kashmiris. Talks with Pakistan can take place,” he added. Today’s function that was attended by thousands of workers of the PDP was a show of strength on part of the PDP president who faces dissent. While the seven rebel legislators including five MLAs led by Imran Ansari stayed away from the party function as expected, former Finance Minister and MLA from Rajpora Haseeb Drabu also was not present. However, sources said he is in Mumbai. Soon after the BJP ended its coalition with PDP in Jammu and Kashmir, Ansari led a revolt against Mehbooba’s leadership accusing her of nepotism. He was joined by his uncle, MLA Zadibal Abid Ansari, MLA Baramulla Javaid Baig, MLA Tangmarg Abbas Wani, MLA Noorabad Abdul Majid Padder, MLC Yasir Reshi and MLC Saifuddin Bhat. The three MLAs from Jammu region — Chaudhary Zulfkar Ali, Shah Mohammad Tantray and Qamar Shah — were also not present but a senior PDP leader said they were busy preparing for a similar function to be held in Jammu on Monday. Those who attended the foundation day fuction included Lok Sabha member Muzaffar Hussain Baig, Rajya Sabha members Fayaz Mir, Nazir Ahmad Laway, MLAs Abdul Rahman Veeri, Ghulam Nabi Lone, Abdul Haq Khan, Syed Basharat Bukhari, Javaid Mustafa Mir, Mohammad Ashraf Mir, Mohammad Khalil Bandh, Asiya Naqash, Syed Faroooq Andrabi, Zahoor Ahmad Mir, Raja Manzoor, Mushtaq Ahmad Shah, Mohammad Yawar Mir, Noor Mohammad Sheikh, Aijaz Ahmad Mir, Mohammad Yusuf Bhat, Abdul Rahim Rather and Altaf Bukhari. Senior PDP leader and MLC Naeem Akhtar, Sartaj Madni, Dilawar Mir, Peerzada Mansoor Hussain Sohrwardhy and Nizam-ud-Din Bhat.